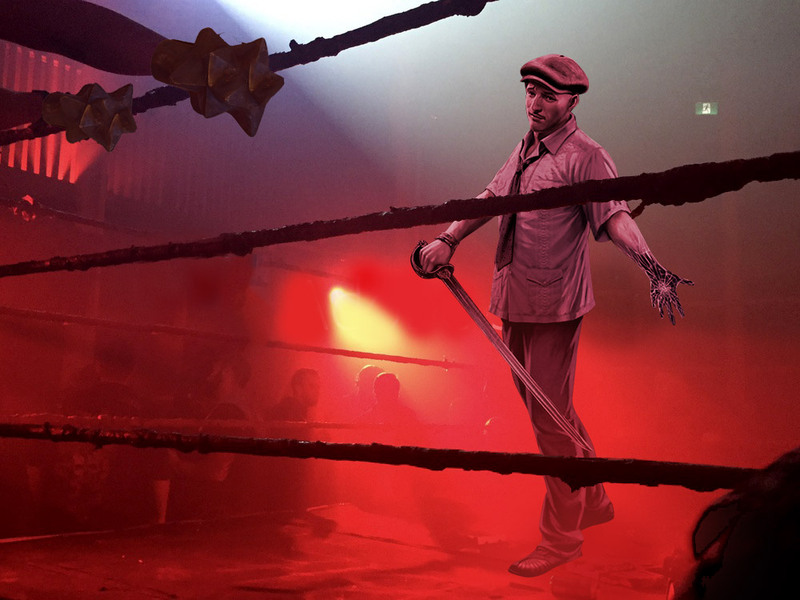 The smoke curled around the bar as it was announced that a brand new competitor would be entering the ring. It looked like Bode had found another desperate mark. He was wearing a loosely bound tie with a short- sleeve dress shirt on. Where had they even found this skinny-armed vislae? What library did they pull him out of? However, as the fight was starting to get under way the crowd pulled behind him. Nearly every person in the bar was shouting for this newcomer — except one man who was covered in whiskey. The crowd was swirling and excited for this newcomer… But. We regulars know how this is going to go. No-one beats Urlosk… NO-ONE. When Urlosk entered and clashed his mace hands together, the energy from the crowd died. This was inevitable, this was a foregone conclusion, this was already written. Once the fight started, Seru pulled out a long wicked obsidian knife. Urlosk saw the knife and laughed, continuing to bang his maces together. Seru looked up, far more brave than he had any right to be, flipped the knife in his hand, and raised his other hand to beckon Urlosk forward. The gall was not required but appreciated, and Urlosk came in with a wide arching blow. One of the spikes scraped across Seru, causing an injury… And the fight was over! Seru shattered into a million pieces of glass! This didn’t take long at all; the outcome was expected of course. But then! The shattered glass reformed instantaneously and standing in the middle of that maelstrom was Seru the fearless! He looked haggard but no longer shattered and came forward! With a quick knife stab, Seru found a small chink in Urlosk’s armor. Urlosk laughed and threw another swing and Seru was able to make a seemingly impossible dodge. He gracefully stepped back and leaned his head back much further than I thought spines could bend. Had he been wearing a beard he would have lost some hairs as the strike barely missed him. Seru was able to lean in and throw another strike, this one having a much larger effect on Urlosk. Urlosk stumbled back. It looked like even Seru couldn’t believe it. Seru looked across the ring as if he couldn’t believe what happened. Why would a telling blow cause a seasoned competitor like this to look as if he had seen a ghost? Urlosk then reached above his head, preparing the blow that we had seen eliminate so many competitors. His hands started their descent, and I’m not ashamed to say I had to close my eyes. Even this reporter, working this beat… I’ve seen so many heads smashed in my days, but you never get used to it. Instead I felt it, felt the shattering impact of Urlosk’s hands going through Seru’s skull and then hitting the ground. I opened one eye so that I could give a proper report on what happened and… Seru was still standing. Instead of delivering his coup de grace, Urlosk’s fists were stuck in the ground. The spikes on his mace hands were shoved into the pit floor and Seru stood up capitalizing on the situation and dealing a terrible blow in retaliation. Urlosk raised his hands again and gave a guttural growl: “You won’t do that to me again, you’ll be dead!” and lowered his arms again in a powerful blow that would swat the gnat before him. However, Urlosk was off balance! His blow landed but he hadn’t yet get his feet under him, and the attack glanced off Seru. Seru tumbled back, again shattered and reformed but really looking much the worse for wear. There’s no way he can keep going, can he? There are literally pieces of him littering the floor! Seru the fearless returned to his friends. The glory is his! I looked down at my purse and noticed that the spheres I was certain I would replace on bets were not coming back. All I was left with was a new experience, a lighter purse and a pamphlet that read “The Order of the Honed Thought needs you”.